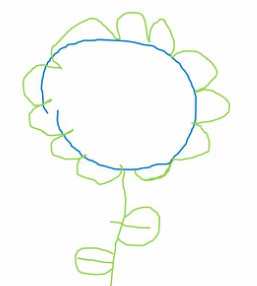 What is a Children's Flower Party? 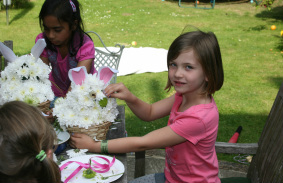 A flower party is a relaxed, hands-on experience where children create something pretty and fun from fresh flowers. 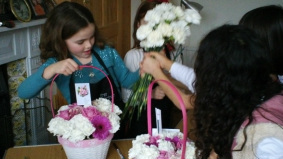 The emphasis is not on the technical side of things but on encouraging the children to "get stuck in" and enjoy working with flowers all under the supervision of The Kitchen Table Florist. 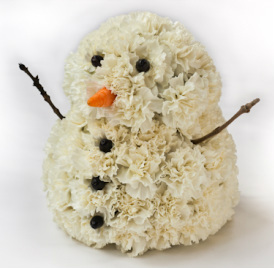 From Butterfly Baskets to Ladybirds and seasonal favourites such as Snowmen and Easter Bunnies, you and your child can choose from a selection of original and stylish creations. These can be wrapped in professional packaging ready for the partygoers to take home at the end of the party. See Gallery for further options. 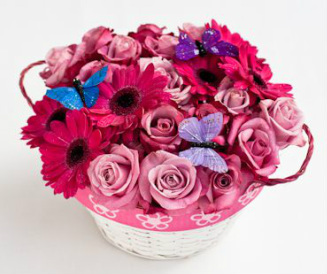 A Kitchen Table Florist Children's Party can last between one and two hours depending on which option you choose. A two hour party would typically involve 1 hour of making our arrangement, 1/2 an hour for food (host to provide) followed by 1/2 an hour of the children packaging up their displays to take home. The arrangements we make typically use between 30 and 50 fresh flowers so each child will take home an arrangement worth between £25 - £30. Party prices do vary depending on which option you and your child choose however a 2 hour party will typically cost between £200 & £250 for 6 children with additional children charged at £30. There is a minimum charge for all party bookings of £200. For a bespoke costing please contact me directly. How old must my child be to have a Flower Party? 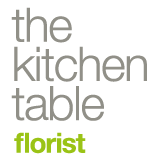 A Kitchen Table Florist children's party can be adapted for all ages but children will get the most out of it from 6+. We will work with you to ensure that the arrangement chosen is age appropriate. For younger children we recommend working with smaller groups so each child gets the help they need to create their arrangement.